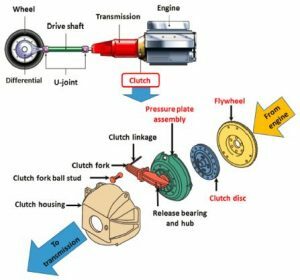 An automotive clutch is a mechanical device in motor vehicles to engage and disengage the running engine to the wheel during gear shifting  without the need to switch off the engine. There are three types of torque transmission clutch– frictional, hydraulic and positive (or dog) clutch . The mechanical friction clutch is the most commonly used in the automotive sector. This clutch type is made up of the spring-loaded pressure plate, single or multiple clutch disk and the flywheel as shown in Figure 1.0. The clutch disk surface functions to grip the rotating flywheel and transfer the power to turn the wheel shaft and mobilize the vehicle. The friction surface of the clutch disk plays an important role in efficient power transmission from the engine to the wheels. This friction can be translated into the rotational speed response of the clutch when it engages/ disengages. A clutch evaluation test captures the rpm response of the clutch disk when a force is applied to the pressure plate in a set-up similar to a car clutch system. Both measurement output is in the form of electrical signals (voltage). Set the recording configuration before the start of the test. Use the ‘Setting’ tab to set the recording interval, time/division, and the recording method. Choose the ‘Realtime’ recording method and set a recording interval of 5ms for each data point and time display axis interval of 500 ms/ division. Figure 3.0 below illustrates these settings. Next, configure the measurement voltage range and the upper limit of measurement for both channels using the [Wave+Set] screen (Figure 4.0). 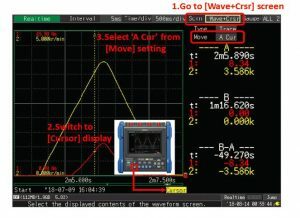 Use the cursor mode at [Wave+Crsr] screen to determine the RPM at specific torque value. Figure 5.0 list the step-by-step to enter the cursor mode. Move the cursor to the desired torque value to obtain the corresponding speed value (Figure 6.0). The obtained value can be used to determine the clutch evaluation result. In the example below, the required speed is 3400 ± 200 rpm @ 8.3 Nm torque. 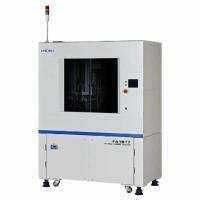 The evaluated sample gives a rotational speed of 3586 rpm @ 8.34 Nm torque and therefore passed the requirement. Hioki HiCorder MR8880-20 offers a versatile yet easy to use solution for clutch evaluation testing on real-time basis. The simple set-up interface and result retrieval enables speedy testing time. HIOKI Singapore Pte. Ltd. is pleased to announce the launch of the Power Quality Analyzer PQ3198, a new instrument that revamps the functionality and specifications of its predecessor, the Power Quality Analyzer PW3198. The product makes it even easier to record and analyse power supply issues, including by eliminating the need for a dedicated sensor power supply and by enabling power and efficiency measurement of two circuits. As power circuits become more complex with increasing use of power electronics devices, large equipment, and geographically dispersed power supplies, power supply issues in the form of electronic device malfunctions and failures are becoming more common. Power quality analyzers are measuring instruments that record and analyze power supply quality in order to investigate the causes of those and similar issues in the field. 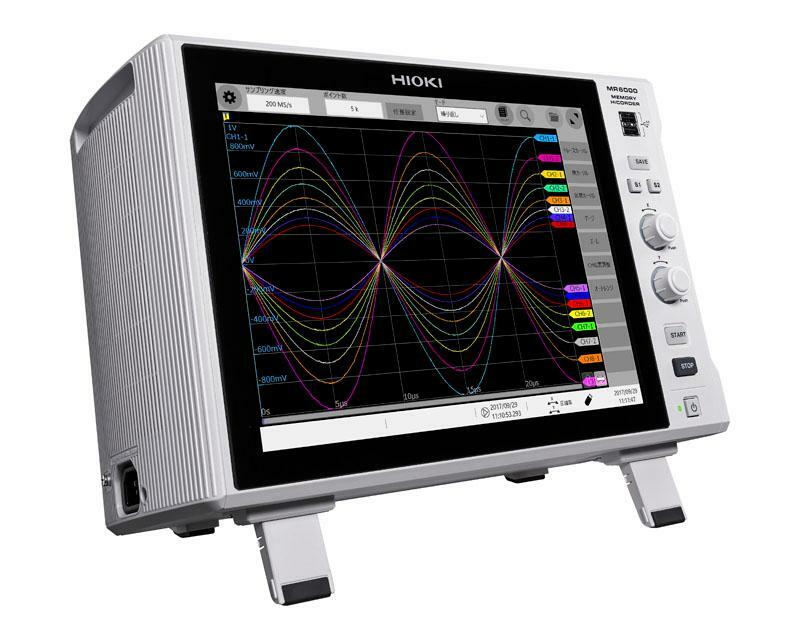 Since launching the Power Quality Analyzer 3196 in 2001, HIOKI has developed a series of increasingly sophisticated products for the product line to accommodate customer needs while helping them resolve numerous power supply issues around the world. 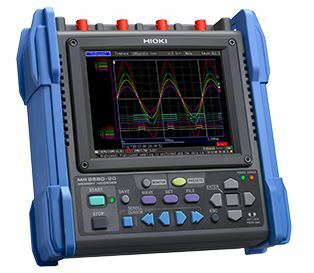 HIOKI’s line of power quality analyzers currently consists of the mid-range PQ3100, launched in October 2016, and the flagship PW3198, launched in April 2011. Those instruments are paired with voltage cords and current sensors that measure voltage and current, respectively, and some of the latter require a separate, dedicated power supply. 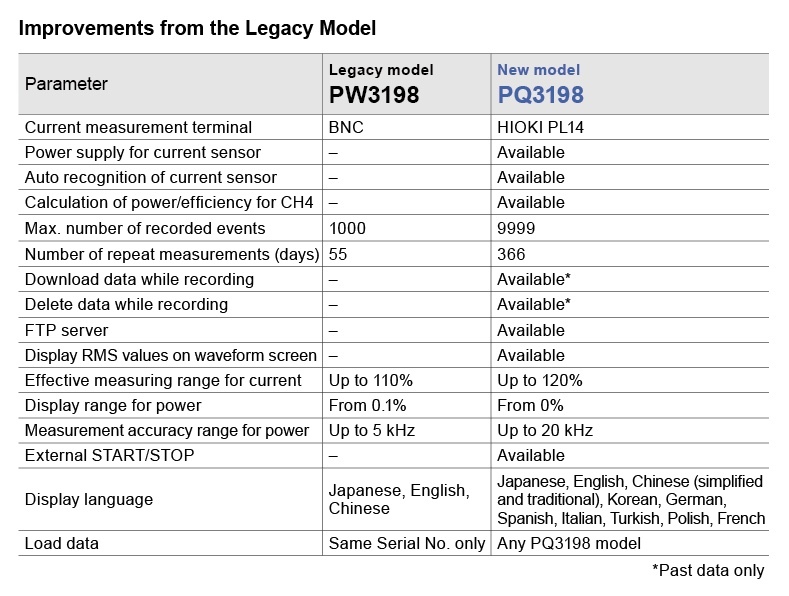 After HIOKI added functionality for powering current sensors to the PQ3100, there was increasing demand from customers to do the same for the flagship PW3198, which led HIOKI to redesign the model. 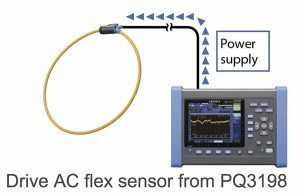 The PQ3198 can supply power to AC flexible sensors*1 and AC/DC sensors*2, eliminating the need to provide a separate, dedicated power supply for those devices as they have required in the past. In addition to making it possible to use the instrument in outdoor locations where power is not readily available, this capability makes it easier to work in confined locations by reducing the number of wires needed to make measurements. The PQ3198 can simultaneously measure power and efficiency on two circuits, for example in the primary (input) side and secondary (output) side of an EV rapid charger’s AC/DC converter or a solar power system. 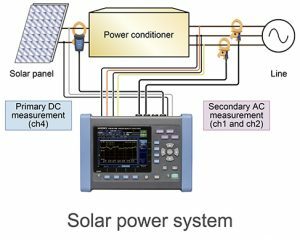 The instrument can also measure DC to AC inverters with a fundamental frequency of 40 to 70 Hz and a carrier frequency*3of 20 kHz or less. The PQ3198 provides an FTP server function, making it easy to acquire data from the instrument remotely. Whereas the previous model (the PW3198) was able to record a maximum of 1000 events, the PQ3198 boosts that number to 9999. Further, it can record continuously for up to 366 days based on repeat recording settings. The PQ3198 ships with PQ ONE, a popular analytical software package that also comes with the Power Quality Analyzer PQ3100. Functionality includes display of event statistics (to display events by date or time of day), EN50160 judgment (for evaluation, analysis, and judgment capability that complies with the EN50160 standard), and report generation. *1 AC flexible sensor: A loop-shaped AC sensor that can be bent freely. 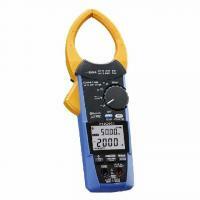 Used to measure wires with a large diameter and large currents. In the context of the PQ3198, “AC flexible sensors” refers to the AC Flexible Current Sensor CT7044/CT7045/CT7046. *2: AC/DC sensor: A sensor that can measure either alternating or direct current. In the context of the PQ3198, “AC/DC sensors” refers to the AC/DC Auto Zero Current Sensor CT7731/CT7736/CT7742. *3: Carrier frequency: The frequency that determines the timing at which the power semiconductors in an inverter circuit switch on and off. Hioki is pleased to announce that SF4000 “GENNECT Cross for Windows,” the free Windows application, has been updated to version 2.20. With this update, the Power Analyzer PW6001 and PW3390 will be added to the compatible instruments that support real-time measurement (logging / monitoring) of LAN-connected devices. 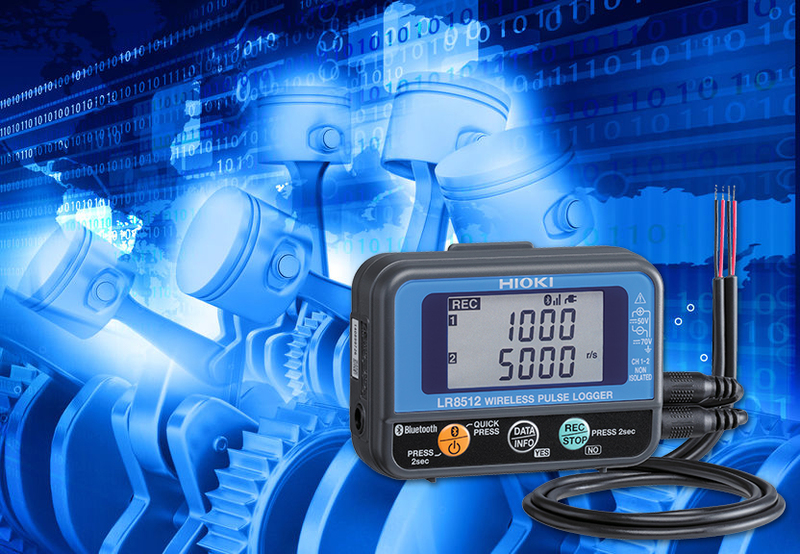 By linking existing devices such as a data logger (Hioki LR8400, LR8401, LR8402, LR8410, LR8416) and a power analyzer via LAN, test results such as temperature, analog input data, voltage, current, power, efficiency, loss, etc., from all connected devices can be viewed together using the software. Up to 512 test results including voltage, current, power, efficiency, loss temperature, and various analog input can be combined on one display, making the software extremely effective for integrated evaluation and analysis of many phenomena. HIOKI E.E. CORPORATION is pleased to announce the launch of the AC Clamp Meter CM4141/CM4142 (rated for use with currents of up to 2000A), a pair of clamp AC current meters featuring a new jaw shape designed to make the instruments easier to clamp around wires. Last year, Hioki launched the AC Clamp Meter CM3289 (rated for use with currents of up to 1000 A) in March, followed by the AC/DC Clamp Meter CM4375/CM4376 (also rated for use with currents of up to 1000 A) in October. All three instruments are designed to be easier to fit around wires being measured. The newly launched CM4141/CM4142 fill out the company’s line of clamp meters while boosting work efficiency and resolving user dissatisfaction stemming from the difficulty of applying conventional clamp meters to wires in an increasing number of settings. Regular maintenance and management are essential in order to keep electrical equipment operating properly in buildings and manufacturing plants. Clamp meters make it easy to measure current simply by clamping the jaws of the instrument around the cable being measured, and as a result they have entered into wide use in maintenance management applications. Distribution panels have been shrinking in recent years, with the result that the wires inside them are packed closer together. Less space between adjacent cables makes it harder for technicians to do their jobs. 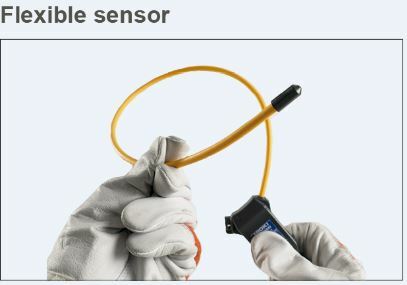 In addition, separately available flexible sensors can be used to measure thick, high-current cables but must be affixed to the clamp meter in order to do so. Such sensors are bendable, loop-shaped devices that are used by routing one end around the cable to be measured and back to the instrument, posing the risk of contact with energized terminals inside distribution panels. By improving the shape of their sensors’ jaws, Hioki was able to design the new clamp meters so that they can be more safely and easily routed around thick, high-current cables. Hioki reduced the width of the jaws near the opening to 11 mm to make the instrument easier to clamp around wires (jaw thickness at the same position ranged from 15 mm to 22 mm in previous products). 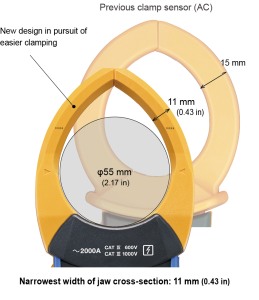 In addition, whereas the CM3289, which was launched last year with a design that is easier to clamp, can measure cables with a diameter of about 33 mm, the CM4141 and CM4142 can measure cables with a diameter of up to 55 mm, providing the ability to measure even thick cables without needing to connect a flexible sensor. Sometimes the jaws have to be pried into place when a large number of cables are packed into a small space. Despite their thin dimensions, the CM4141 and CM4142’s jaws are strong enough to withstand being maneuvered into place. The CM4141/CM4142 delivers accurate results even when measuring AC current waveforms that have been distorted by a device such as an inverter or switching power supply. Whereas the previous model was able to measure currents of up to 1000 A AC, the new models can measure up to 2000 A AC. Since they offer three ranges (60.00 A, 600.0 A, and 2000 A), they can be used in a variety of applications. The CM4141/CM4142 is more than 100 g lighter than a conventional clamp meter of the same size. As a result, the load on the hand when holding the instrument for an extended period of time has been significantly reduced. The CM4141/CM4142 can measure multiple parameters, including AC current, AC/DC voltage, frequency, continuity, resistance, capacitance, diode, and temperature. HIOKI’s free smartphone app GENNECT Cross can be used to transfer measured values from the CM4142 to a smartphone. In addition to creating simple reports (in PDF format), the app can save data as a CSV file for later editing in Excel. • Carrying out electrical work, building maintenance, plant maintenance, etc. Hioki is pleased to announce the launch of the Flying Probe Tester FA1817, an automatic testing system designed to inspect printed wiring on bare boards*1. The FA1817’s features and capabilities make it ideal for use in inspecting high-density printed wiring boards. 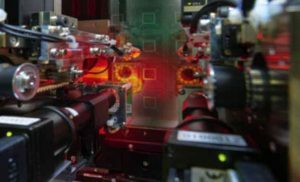 With support for a broad range of test types, from low-resistance measurement to high-insulation-resistance measurement, the system reliably detects the latent defects that trouble end-users. In addition, Process Analyzer, a newly developed application that shipsstandard with the FA1817, makes it easy to create statistical data based on on test results and to analyze defects. In this way, the system can be used not only to perform pass/fail testing, but also as an aid in realizing process improvements. Printed circuit boards (PCBs) onto which electronic components have been mounted can be found in industrial equipment, automotive devices, consumer electronics, and other products, where they play an extremely important role by providing device operation and control functionality. To ensure their electronic components function properly, bare boards must exhibit high quality and reliability. In recent years, miniaturization of electronic devices has seen bare boards with finer-pitch, higher-density patterns, as well as large numbers of layers, with the result that latent defects are becoming more common. 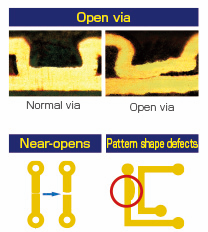 Recognizing the needs of customers that wish to improve the quality of such bare boards, Hioki developed the FA1817 as a system capable of detecting a variety of phenomena that can cause latent defects, including open vias, near-open defects, micro-shorts, and arc discharges. 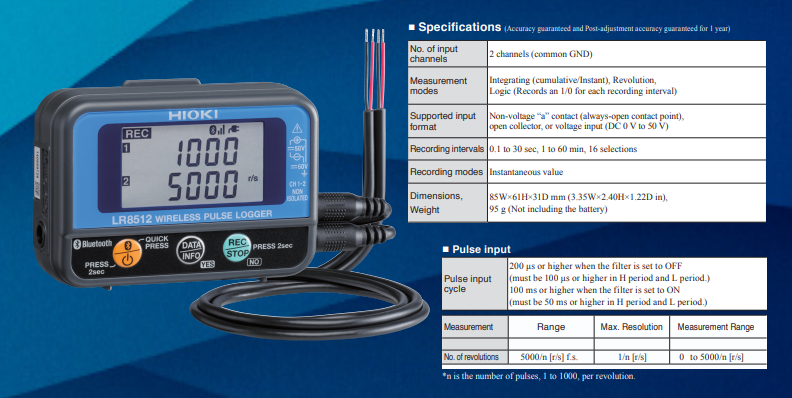 Hioki has taken advantage of its exceptional technological capabilities in the areas of low-resistance measurement and insulation resistance measurement to deliver the ability to measure low resistance as well as high insulation resistance of 100 GΩ/250 V (when using dedicated probes and measurement boards). The FA1817’s low-resistance measurement functionality measures minuscule fluctuations in resistance values to detect open-via defects. By means of its high-insulation-resistance measurement capabilities, the system also detects insulation abnormalities and arc discharge phenomena caused by the effects of pattern shape anomalies and impurities, voids, and other defects that exist between patterns. Traditionally, probes are placed in contact with the board to carry out bare board testing in a process that leaves impact marks on the board. On high-density bare boards, even small marks can have a serious effect. Impact marks from the probes of previous products were already slight, but the FA1817 uses the High-density Probe CP1072, which was developed using proprietary Hioki technology, in order to further reduce the size and depth of these marks. Impact mark depth has been halved compared to that of previous products to minimize damage to bare boards. By taking advantage of two top arms and two bottom arms to probe target boards efficiently, the FA1817 reduces testing times by up to 20%. The Process Analyzer application makes it easy to load accumulated test results data in a batch and then create statistical data from it. Test step results can be visualized using such means as value changes, histograms, and distribution maps to facilitate analysis of defects. By generating information about analyzed defects that can be provided as feedback to design and manufacturing processes, the Process Analyzer helps customers improve yields in printed wiring board manufacturing. Hioki is please do announce the release of the AC/DC Current Sensor CT6875 (rated for 500 A) and CT6876 (rated for 1000 A). 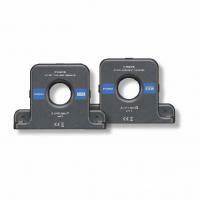 The pair of pass-through current sensors deliver significant improvements in frequency band and noise resistance over their predecessors (the AC/DC Current Sensor 9709 and CT6865), making them ideally suited for use in applications such as measuring the efficiency of the increasing high-current, high-speed inverters that are used in today’s electric and hybrid vehicles (EVs and HEVs). The automotive market’s global transition to EVs began gathering momentum during the second half of 2017. Most of the first EVs and HEVs to be introduced were compact vehicles whose development necessitated measuring currents of around 200 A, but the moveto bring electric drivetrains to larger vehicles has led to demand for the ability to measure currents of 500 A and higher. In addition, adoption of SiC/GaN elements*1 in inverters is driving increases in power conversion unit switching speeds (on/off cycle speeds) and efficiency. Consequently, the industry demands current sensors that can measure larger currents with greater precision over a wider band of frequencies and in a broader range of operating temperatures than ever before. Legacy Hioki sensors capable of measuring currents of 500 A and greater include the AC/DC Current Sensor 9709 (rated for 500 A) and CT6865 (rated for 1000 A), but those devices offered insufficient performance to fulfill the required specifications. To address this shortfall, Hioki developed the CT6875 and CT6876 by improving the performance of those two products. *1 Silicon carbide (SiC) and gallium nitride (GaN) are being used as replacements for silicon in the manufacture of next-generation semiconductors. The CT6875 provides a frequency band of 2 MHz, which is 20 times that of its predecessor (the 9709), while the CT6876 provides a band of 1.5 MHz, which is 75 times that of its predecessor (the CT6865). Enhanced shielding enables the effects of noise such as common-mode voltage to be significantly reduced in current measurement at high frequencies. Engines, particularly diesel ones, are expensive and known to have a long lifespan. Engines are built to run within an environment and load limit. However, the improper operation conditions often kill the engines prematurely. Overload is one of the top three common reasons . An overloaded engine cannot reach its rated Revolutions per Minute (RPM) under a full load of fuel and water tanks capacity . Continued operation of an overloaded engine leads to excessive black smoke emission during cruising, high exhaust temperature beyond manufacturer’s specification, excessive fuel consumption, slow acceleration, reduced engine life, and exhaust flow components failure. Engine RPM denotes the number of times the engine crankshaft rotates around its axis and translates to the torque or power produced. 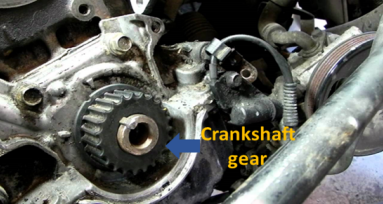 The piston movements during engine cylinder combustion drive the crankshaft’s rotational motion . In engine commissioning test, the RPM test is one of the tests to ensure that the end user complies with the engine build specifications. The engine RPM measurement involves the measurement of the crankshaft gear’s rotational speed. This gear contains a fixed number of teeth (Figure 1.0). drawback for this method is that it requires space for instrument mounting and thus does not suit engine mounted at constraint spaces. ii) Stroboscopic using intense flash that strobes at high frequency. The measured rotating object will appear to be stationary when the frequency of the light synchronized with the RPM of the object. It takes multiple adjustments to get the synchronized frequency and requires manual logging of the result. during engine commissioning where engine RPM and other parameters measurement are required. 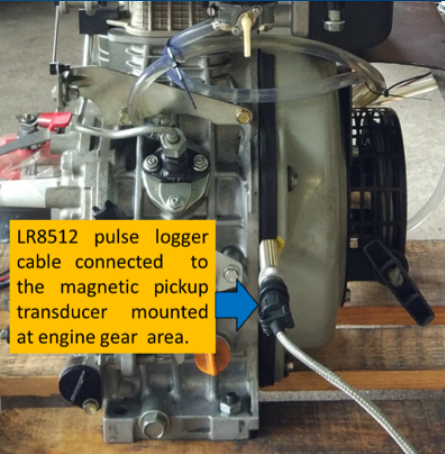 The LR8512 logger connection cable connects the logger to the magnetic or electrical pickup transducer that is mounted close to the engine gear area (Figure 2.0). The pickup transducer will return a signal when a gear teeth passes by the location the transducer . One complete rotation through all the teeth on the gear signifies one revolution. This number of teeth needs to be keyed into the logger as reference and can be done wirelessly (via Bluetooth) using LR8410 as shown in Figure 3.0 with an example of a gear with 97 teeth. The LR8512 reports RPM in r/sec (Figure 4.0). Users can also report in other units using the ‘Scaling’ function. Example for reporting in r/min unit set the scaling ratio value to ‘60’ and the unit to ‘r/min’ (Figure 5.0). Aside from the small size, the Hioki LR8512 mini logger’s easy set up features for engine rpm testing makes it an ideal tool for this purpose. The remote monitoring feature enables real-time monitoring and automated data retrieval of test data. Engine RPM testing is particularly useful for engines commissioning for warranty coverage by engine manufacturers. While Memory Recorders don’t have sampling speeds that are as fast as those of digital oscilloscopes, these waveform recorders can be used to record various types of signals without worrying about potential differences between them and without using isolation amplifiers. 01. What is a Memory HiCorder? Typical waveform recording instruments have included the oscilloscope, electromagnetic oscillograph, and pen oscillograph (a category that includes pen recorders). With progress in digital technology, analog oscilloscopes gave way to digital oscilloscopes, while electromagnetic oscillographs and pen oscillographs gave way to memory-based recorders (transient recorders). The Memory HiCorder is such a memory-based recorder. Figure 1-1 illustrates the basic architecture used by Memory HiCorders, which consist of A/D converters, data memory, a waveform display, and a printer along with a CPU that controls them. The A/D converters function to convert input analog signals into digital signals, which are then stored in the instrument’s memory and displayed or printed as waveforms. This section explains why analog pen oscillographs (pen recorders) and electromagnetic oscillographs were replaced by Memory HiCorders. Pen oscillographs are self-balancing recorders with servomotors that operate in proportion to the amplitude of input signals to move pens and thereby record signal data. They have a response speed on the order of dozens of hertz, but their use of mechanical means to represent amplitude imposes limits on that speed, and ink-type variants require regular maintenance. Electromagnetic oscillographs use high-sensitivity reflecting elements that are deflected according to the amplitude of the input signals in order to reflect light from a light source onto photosensitive recording paper. This method of measurement is capable of attaining high-speed recording with paper feed speeds of up to 200 centimeters per second (5 ms/cm) and response speeds on the order of several kilohertz, but it suffers from difficulties in the form of the high running costs associated with the photosensitive paper (resulting from the instrument’s high speed) and handling of the reflecting elements. Memory HiCorders incorporate a thermal dot array printer (with a high resolution of 8 dots per millimeter) for printing recorded data, and this design offers high reliability due to the absence of moving parts such as pens. The instruments generally offer high response speeds, with sampling speeds of up to 20 MS/s (50 ns). They also combine extensive trigger functionality with low running costs, since users can retrieve only that waveform data which is necessary. Despite enhanced functionality and performance, the instruments have fallen in price, and for these reasons they have displaced electromagnetic oscillographs and pen recorders. With a maximum sampling speed of 20 MS/s, Memory HiCorders are slower than digital oscilloscopes, but they are characterized by the ability to accept input of numerous signals without use of isolation amplifiers or concern for potential differences between signals. 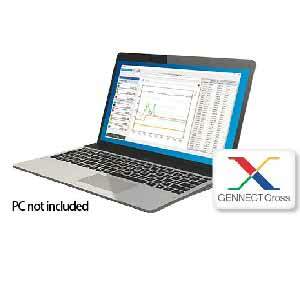 Recorded data can be stored on the instrument’s built-in SSD, a CF card, or a USB flash drive. Each input unit generally provides two channels of input, and the instrument can accommodate input of up to 1000 V DC (700 V AC) as well as dynamic strain, thermocouple, logic, and other input simply by switching input units. By connecting the instrument to a computer via its USB or LAN interface, users can transfer data and control the instrument remotely. 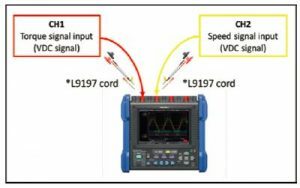 Currently available recording and waveform observation instruments can be broadly divided into three categories: oscilloscopes in the high-speed segment of the market, Memory HiCorders in the medium- and low-speed segment of the market, and data loggers in the low-speed segment of the market. Customers choose instruments based on the frequency of the signal waveform being measured and recording interval, or based on characteristics such as input signal voltages, if the circuit being measured has a different ground potential. While digital oscilloscopes excel in their ability to observe high-speed phenomena, their use of a common ground for all channels introduces the risk of shorts between circuits and ground faults when measuring circuits that are at different potentials relative to ground or when measuring targets such as mechatronic control circuits that mix strong and weak currents. Since Memory HiCorders use isolated channels, they are able to perform tasks such as measuring DC control signals while observing a commercial power supply’s AC waveform or recording waveforms between inverter or converter inputs and outputs. As a result, they shine in applications involving measurement of circuits mixing strong and weak currents, as mentioned above. Thanks to improvements in sampling speeds, Memory HiCorders have frequency characteristics that exceed the audible frequency range, and as discussed above, an extensive range of input units gives them capabilities ranging from electrical measurement to measurement of mechanical and vibration physical properties. Figure 1-6 illustrates the frequency bands for signal waveforms and compatible waveform measuring instruments in a variety of fields. 02. What is the Difference Between a Digital Oscilloscope and a Memory HiCorder? The biggest difference between Memory HiCorders and digital oscilloscopes lies in isolation of input channels from one another and from the instrument. A Memory HiCorder’s input channels are all electrically isolated. In a digital oscilloscope or A/D board, one side of each input channel is connected to the ground. Digital oscilloscopes are well suited to use in applications where it is necessary to observe multiple signals that share the same ground, for example in measuring the electrical signals on a circuit board. However, if it were used to simultaneously measure the input and output sides of a power conversion device (such as a converter or inverter) like that shown in Figure 2-1, a digital oscilloscope would experience an internal short-circuit. Memory HiCorders are extremely useful in applications such as this where a large number of signals at different potentials must be measured. The only way to use a digital oscilloscope in such applications is to place an isolation amplifier between each signal and the instrument. Most digital oscilloscopes have a resolution of 8 bits (yielding 256 points). For example, if using a ±10 V range, that means the smallest interval that can be detected by the instrument is 0.078 V (obtained by dividing the full span of 20 V by 256 points). Most Memory HiCorders have a resolution of 12 bits (yielding 4,096 points), enabling them to read values at an interval of 0.0048 V under the same conditions. A Memory HiCorder with a resolution of 24 bits would be able to read values at an interval of 0.000001192 V.
Memory HiCorders also offer superior accuracy. 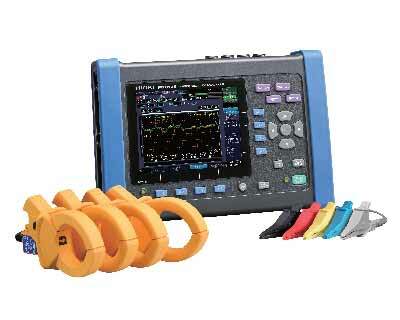 Whereas a typical digital oscilloscope provides accuracy of ±1% f.s. to ±3% f.s., Memory HiCorders deliver accuracy of ±0.01% rdg. and ±0.0025% f.s. to ±0.5% f.s. This level of resolution and accuracy makes it possible to observe output from mechanical displacement, vibration, and other sensor types at a higher level of detail. Whereas typical digital oscilloscopes have 4 input channels, Memory HiCorders can accommodate from 2 to 54 channels of input, depending on the model. In addition, different input units can be used, enabling Memory HiCorders to accept a larger variety of signals. Available input units include analog units that can accept 1000 V DC (600 V AC) voltage input; units that can be connected to thermocouples, strain gauges, and acceleration pickups; and units that can be connected to high-precision current sensors. Other units go beyond signal input to enable signal output with function generator and arbitrary waveform generation functionality. Memory HiCorders shine in the field of mechatronics, where they deliver functionality that lies beyond the capabilities of digital oscilloscopes, for example in mixed recording of voltage and current waveforms and control signals for motors, inverters, and converters and in recording gasoline engine strain and ignition waveforms. Each Memory HiCorder provides enough functionality to be used as a number of different types of measuring instrument. The instrument can record high-speed transients and sudden phenomena whose timing is unknown. It can also perform a variety of waveform calculations. Although the instrument can be used as a real-time recorder or normal recorder, its extremely fast response speed, which is on the order of several microseconds, also enables it to record the amplitude of phenomena such as noise, even at low speed settings. The instrument can record RMS voltage levels of current input without an RMS converter, and it can record fluctuations in supply voltage. The instrument can be used as an X-Y recorder for data from multiple X-T (time axis) recorded channels, with a user-specified channel as the axis. Recorder functionality can be used to record long-term fluctuations, and memory recorder functionality can be used to record sudden phenomena. The instrument can analyze the frequency components of phenomena such as vibrations using its frequency analysis function. In addition to analog input, the instrument can record logic. Mixed digital/analog recording makes it possible to measure characteristics such as sequence timing. The trigger function plays an important role in configuring a Memory HiCorder. When recording high-speed transients, this functionality makes it easy to start and stop measurement based on complex patterns that would be impossible for a human operator to duplicate manually. The following introduces some Memory HiCorder trigger functions. Figure 4-1 illustrates the types of trigger sources supported by Memory HiCorders. With the exception of manual triggers, triggers are activated based on AND/OR conditions between sources. Triggers can also be activated based on AND/OR conditions between analog channels and between logic channels. The level trigger is activated when the input voltage either rises above or falls below a set trigger level. A trigger filter can be set to keep the trigger from being activated by noise or other phenomena. Triggering occurs when the signal enters (IN) the defined upper and lower threshold range. Triggering occurs when the signal exits (OUT) the defined upper and lower threshold range. Phenomena such as momentary voltage dips and power outages can be detected using a trigger designed specifically for use with commercial power supplies (50/60 Hz). The user sets a peak value (or an RMS value), and the trigger is activated if input falls beneath that level. Triggers can be activated when the period is outside of the specified time width, based on frequency variation and so on. Triggers can be activated based on RMS levels. Triggers can be activated according to signal input on logic channels. Triggering occurs at the specified interval from the specified Start time until the Stop time. The external trigger is activated based on an external signal. The trigger is activated using a no-voltage contact signal or a 5 to 0 V signal. The external trigger has two inputs and outputs so that trigger output can be connected to another Memory HiCorder to enable simultaneous trigger operation. Triggers can be activated by pressing the manual trigger key. Select from the below setting modes whether to record one recording length per trigger event, or to record continuously. Only one trigger activation is accepted by the instrument. When the trigger activates once, the waveform is recorded for the set recording length, and then measurement stops. Repeated trigger activations are accepted by the instrument. When no trigger has been activated, the instrument enters the trigger standby state. Repeated trigger activations are accepted by the instrument. If no trigger is activated after approximately 1 s, the instrument automatically records the waveform for the recording length. The user sets the trigger point as a percentage, using the recording start point for the set recording length as 0% and the recording stop point as 100%. By setting this pre-trigger, it is possible to review conditions before the trigger (malfunction or anomaly) occurred. Engine combustion analysis, ECU signal analysis, ABS testing, suspension testing, navigation system testing, airbag testing, 4WD testing, transmission testing, vibration testing while the vehicle is driven, sensor signal analysis, etc. Element control testing, inverter motor control testing, train operation control testing, etc. ; brake characteristics and vibration analysis, etc. A level trigger should be activated at the rising edge of the primary input when the power switch is turned on. Since we want to capture data for about 2 s, set the shot length (recording length) to 20 div. at 100 ms/div. Since the primary side of the circuit is 100 V AC, which yields a P-P value of 282 V, set channel 1 to 100 V/div. Since the secondary side is 5 V DC, set channel 2 to 1 V/div. Since the voltage will change from 0 to 100 V (RMS) when the switch is turned on, set the trigger level to a rising slope that is greater than 0 V. This explanation will use a setting of 10 V.
Since we want data after the switch is turned on, use a pre-trigger setting of 10%. Since we need only one measurement, use single mode. If you wish the instrument to print data automatically when the trigger activates, turn on automatic printing on the status (settings) screen. If you wish to automatically save data in external memory, select the type of media and select the data format (binary or text). If you capture data on the screen even though automatic printing is off, you can record or print it later using the PRINT key, so turn this setting off. Check the input cord connections and press the START key. If the display indicates that the instrument is in the trigger standby state, it has been set up properly. Turn on the power supply switch. If the instrument has been configured correctly, measurement will end once acquisition of the waveform data is complete. Configure a trigger so that it is activated by the falling edge of the AC power supply. Since the level trigger would not be activated for channel 1, use either a voltage drop trigger with peak value detection or set up a trigger to activate at the falling edge of the DC output voltage level. If you have a line-use logic probe, you can also set up a trigger to activate when the input logic level switches from 1 to 0. This explanation will focus on the measurement procedure when using a voltage drop trigger. Once you understand how to use this voltage drop trigger, you will be able to measure momentary outages and momentary voltage drops affecting AC power supplies. Select the voltage drop trigger for channel 1 and set it to 5 V.
Turn off the power supply switch. If the instrument has been configured correctly, measurement will end once acquisition of the waveform data is complete. 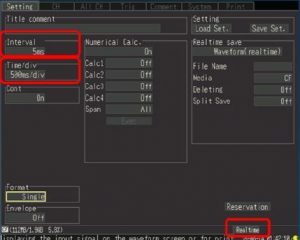 Change the trigger condition settings and the logic channel display settings. Other settings are the same as described above. Since the trigger will be activated based on logic input, set up a logic trigger. Using channel A1 [0.x.x.x] 4, set up the trigger so that it activates when channel A1 changes from 1 to 0. Display the logic channel A1 on the channel display screen. 3) The remaining settings are the same as those that were described in the previous section. If you encounter a self-hold circuit such as a sequence control circuit that exhibits the issue of resetting when this approach is applied, you can analyze the issue, for example in the power supply circuit, by setting up a trigger to activate depending on whether or not the self-hold circuit has a voltage. Although instruments such as normal ammeters cannot be used to measure quantities such as instantaneous load current fluctuations or starting current, a Memory HiCorder can easily do so using waveform levels when utilized in combination with a clamp current sensor. Use a clamp current sensor and set up a trigger so that it is activated by the starting current. Use the scaling function so that current values can be read directly. Use a Hioki 9018 Clamp On Probe. The output rate will be 500 A AC  200 mV AC. 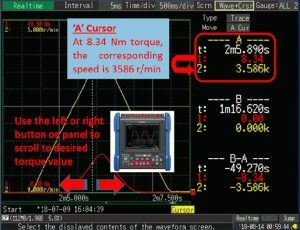 You can also display trace cursors, use them to measure the maximum value and rush current time, and then use the parameter calculation function to calculate the maximum value. The recording length varies with the load, but here we will use a setting of 10 div. at 50 ms/div. to capture 0.5 s.
Since the clamp current sensor we’re using generates 200 mV AC output, set the 0 position to 50% using the 50 mV/div. range. Select 2-point scaling on the system’s scaling settings screen and configure the settings as shown in Figure 5-12. Since use of the ENG setting in combination with scaling enables settings in units of 103 and 106, you can read values as indicative of units with a K, M, or G prefix. Since we need data after the trigger is activated, use a setting of 10%. Set parameter calculation to “ON” on the status (settings) screen and specify a calculation for channel 1 only. Since data remains, moving the flashing cursor to the parameter calculation “ON” setting will cause an “EXECUTE” button to be displayed on the function key GUI display. Press that button. The maximum value calculation result will be displayed on the screen.